With the DI100, you can rest assured that your sound source will reach the console balanced and noise-free. BEHRINGER's take on the all-important active DI box gives you functionality, durability and incredible sound at a remarkable price. Plug into the DI100's balanced 1/4" TRS or XLR input, then send a signal to your console via the balanced XLR output. You can even plug your guitar or bass amp's speaker output into the DI100, which can handle ratings of up to 3,000 Watts and still deliver a perfect signal. It also features a 1/4" LINK jack to send your signal to an on-stage amplifier. The DI100 also has a switchable attenuation pad, allowing input levels of up to +50 dB. There is also a ground lift switch to eliminate noise associated with ground loops. The DI100 also features BEHRINGER's renowned OT-1 output transformer. DI boxes are an essential part of any stage or studio, and the DI100 delivers the exceptional sound you expect, wrapped up in a rugged, road-proof aluminum case with stackable rubber corners. 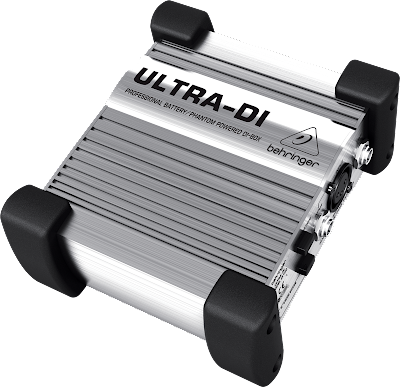 Find out how the ultra-affordable DI100 can improve your sound at your nearest BEHRINGER dealer.